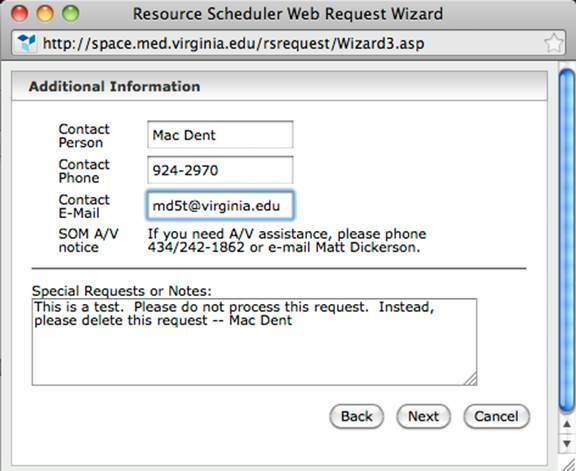 Web Request (WR) is a parallel system to Resource Scheduler. 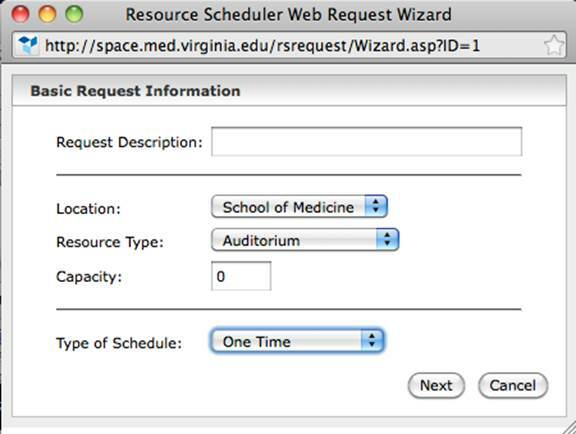 Almost anyone can use WR to request a reservation for a resource found in Resource Scheduler. This document will show the user how to access and use the basic tools in WR. WR does not have accounts. 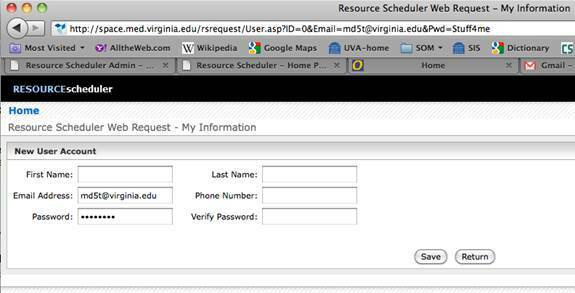 Instead you access WR using your UVA email address. Click on Add. This is the only time you will click on Add. 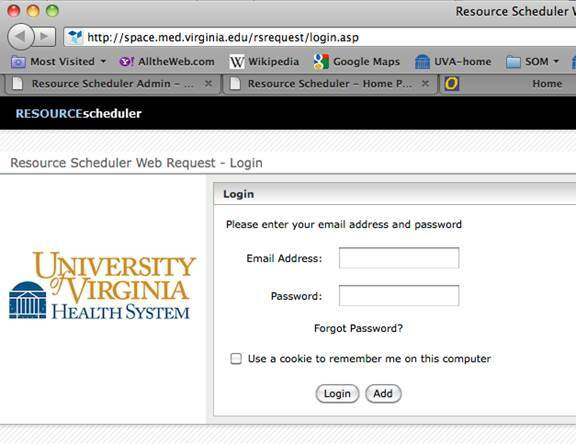 During future login, click on Login. On the My Information page, you can enter your first name, last name, phone number and confirm your password. Click on Save when finished. Now you are at the main screen for WR. The date defaults to the current date. 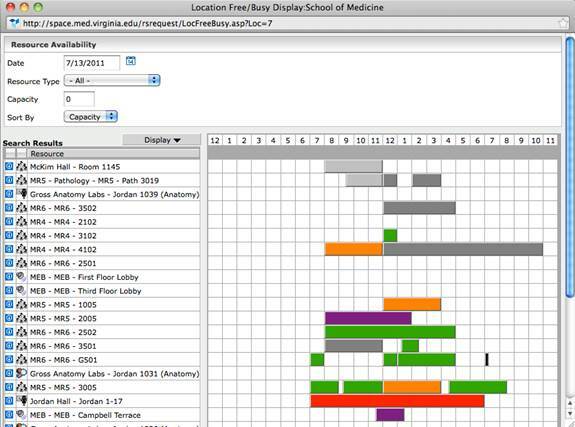 To change a date, enter a new date in the Date field, or click on the calendar icon and select a date from there. If desired, select a particular Resource Type and/or Capacity. All four windows are self-explanatory. Fill out the four windows and press Finish when complete. Your request goes to the person in charge of the resource. They will either accept or deny the request, and you will be notified both in WR and via email. The information in the Request Description field will be the title of the event, and will be displayed on monitors and door side signage. This field should not contain messages or description details. That information can be placed in the Special Requests or Notes field seen below. Extensive help exists on line. From any screen, click on the Help link in the upper right corner. On this screen, click on View On-line Help. This opens a new window where the user can access all on-line help.